What is the abbreviation for If You Know What I Mean? A: What does IYKWIM stand for? IYKWIM stands for "If You Know What I Mean". 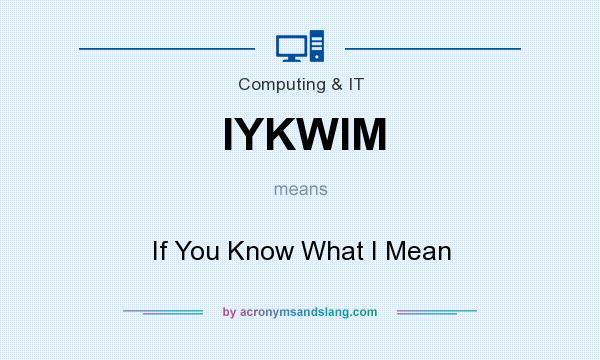 A: How to abbreviate "If You Know What I Mean"? "If You Know What I Mean" can be abbreviated as IYKWIM. A: What is the meaning of IYKWIM abbreviation? The meaning of IYKWIM abbreviation is "If You Know What I Mean". A: What is IYKWIM abbreviation? One of the definitions of IYKWIM is "If You Know What I Mean". A: What does IYKWIM mean? IYKWIM as abbreviation means "If You Know What I Mean". A: What is shorthand of If You Know What I Mean? The most common shorthand of "If You Know What I Mean" is IYKWIM. DYKWIM - Do You Know What I Mean? KWIMV - Know What I Mean, Vern? YKWIMJB - You Know What I Mean, Jelly Bean? NAMEAN - Do you know what I mean? NAWM - Know What I Mean? YKWIS - You Know What I'm Sayin?